Our Brunswick Room is located on the Mezzanine floor just one flight of stairs above our Woburn Hall and can seat up to 18 boardroom style or 30 theatre style. The room comes with natural daylight and secondary glazing ensuring a pleasant and peaceful environment for meetings and presentations. This popular room comes with HD LCD Projector, glass whiteboard and flipchart included in the hire price. 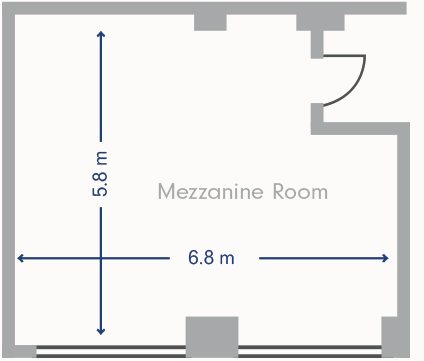 The room is 6.8 x 5.8 (LxW) in size. A range of catering and AV services can be provided in the room. The Bookings Team are available to assist with planning these arrangements.The furniture arrangements detailed are the standard layouts. They may be varied according to your needs but must comply with Health and Safety Regulations.